It seemed like months had passed since He-Man began his quest to tame a wild Eternian tiger and recruit him in his noble cause against the forces of evil. Though he had engaged several of the beasts during the last few weeks, none were up to the task of challenging the young warrior. 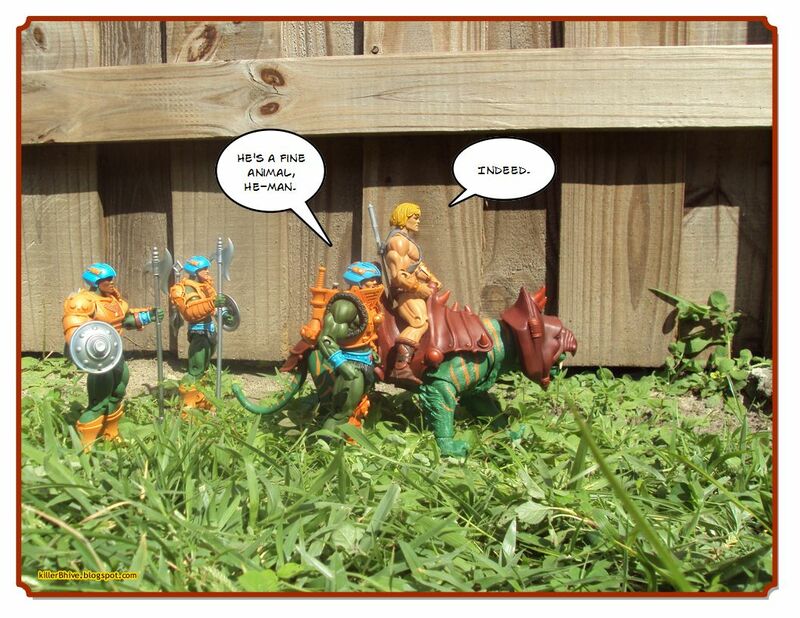 For although they are wild animals, they too can sense the power of Grayskull, pulsating through the warrior prince. Most fled in terror while others quickly withdrew after attempting to attack. But on this day, one tiger, fully aware he is being tracked, has led He-Man back to the exterior palace walls, as if to say "I know where you come from and know who you are." 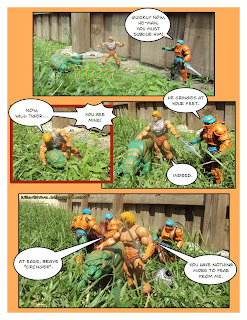 He-Man thinks he has the upper hand, surprising the tiger, but quickly learns how strong these creatures are. With one swipe of his huge paw, the beast nearly penetrates He-Man's chest armor and sends the warrior crashing against the palace wall. 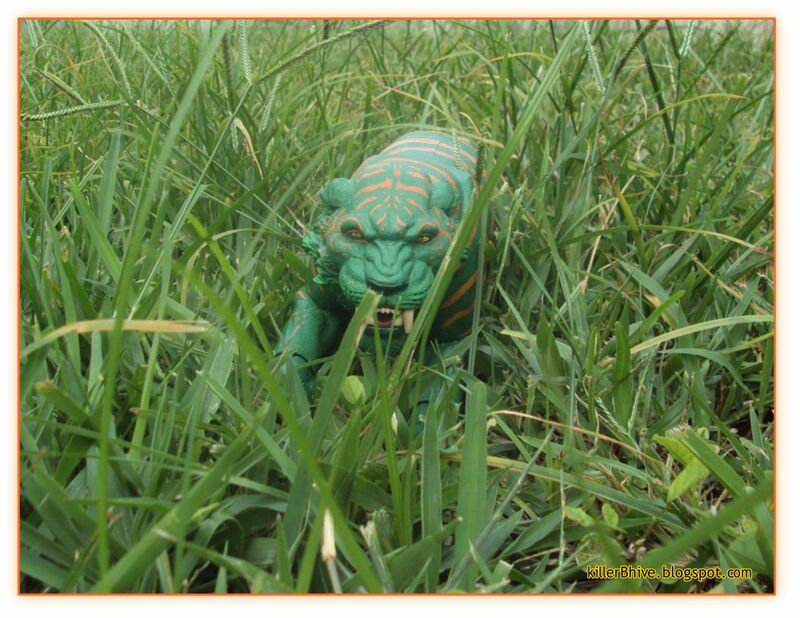 It becomes quite clear to He-Man that no simple whip will tame this fearsome animal. He-Man's strength is phenomenal, but not immune to an Eternian tigers sharp claws and fangs. 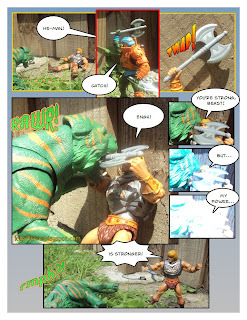 Man-at-Arms is standing by with He-Man's arsenal and quickly produces his power axe to fend off the tiger's next attack. The warrior comes face to face with the monstrous cat once again. He sees a burning passion within the beast, one that he knows he'll need to fight off the evil hordes of demonic creatures Skeletor will unleash on the planet. The tiger, too, sees something within the young warrior. A great pride in the mission he has undertaken. A surge of power that goes beyond what he harnesses from Grayskull. A desire to use that power only for good. 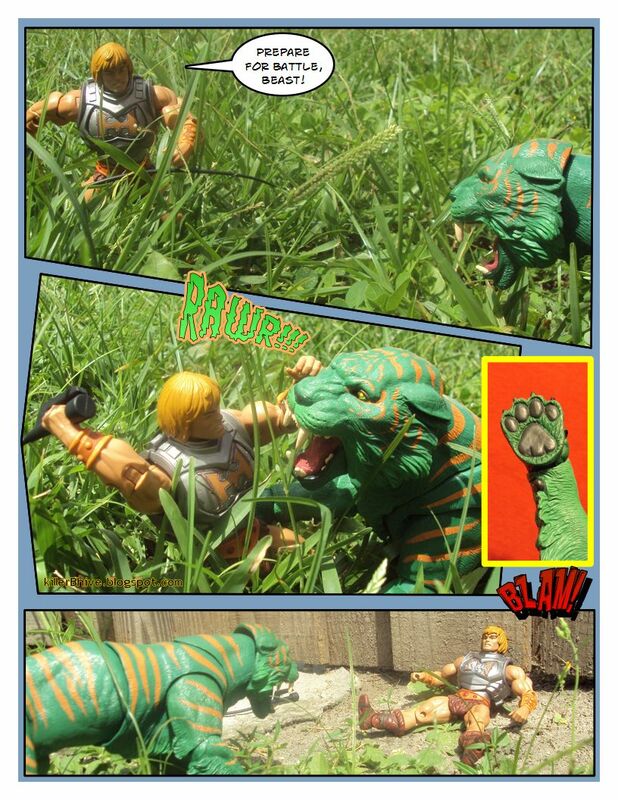 He-Man powers the hefty cat off of him, stunning him. He quickly lunges on to the animal and pins his head down, but only enough to keep him down, until he relaxes his muscles and knows he is bested. Having witnessed the true power of the man known as "He", the tiger understands the warrior's true motivation for attacking him. 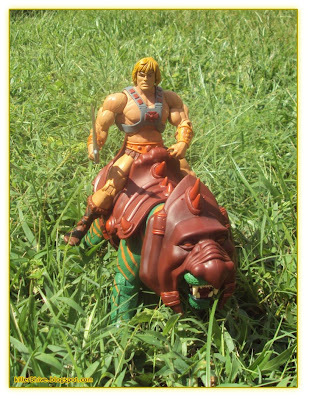 The beast feels a kinship with him and accepts his new role as a protector of Eternia and loyal steed of He-Man. As the power sword of Grayskull comes closer, he senses the presence of warriors past. He fully understands his new mission and the responsibility of protecting his rider. 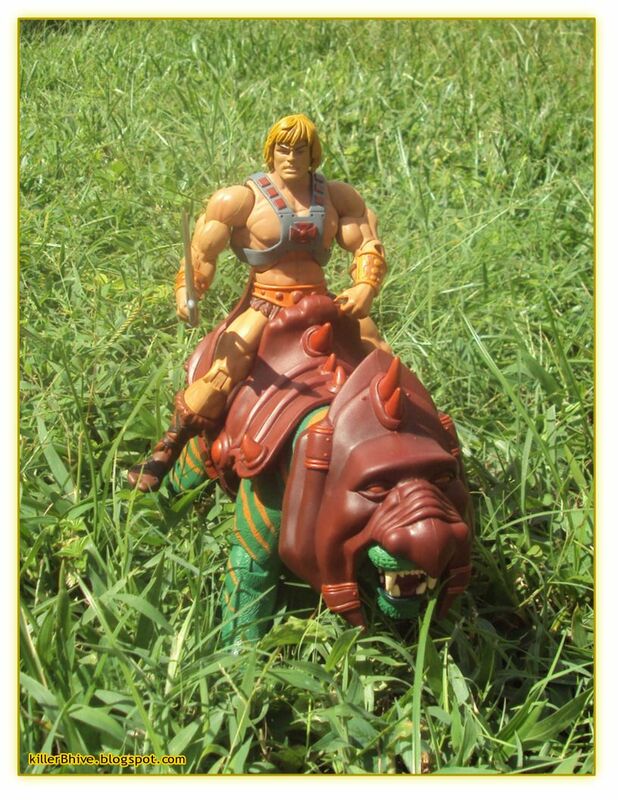 The power of Grayskull now surges through He-Man and his powerful steed, Battle Cat. 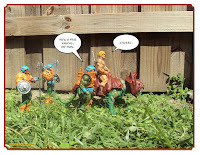 Together they represent the most powerful force on Eternia and will chase down evil wherever it may be found. With armor and rider in place, Battle Cat is prepared to serve the people of Eternia and challenge any beast that would do them harm. 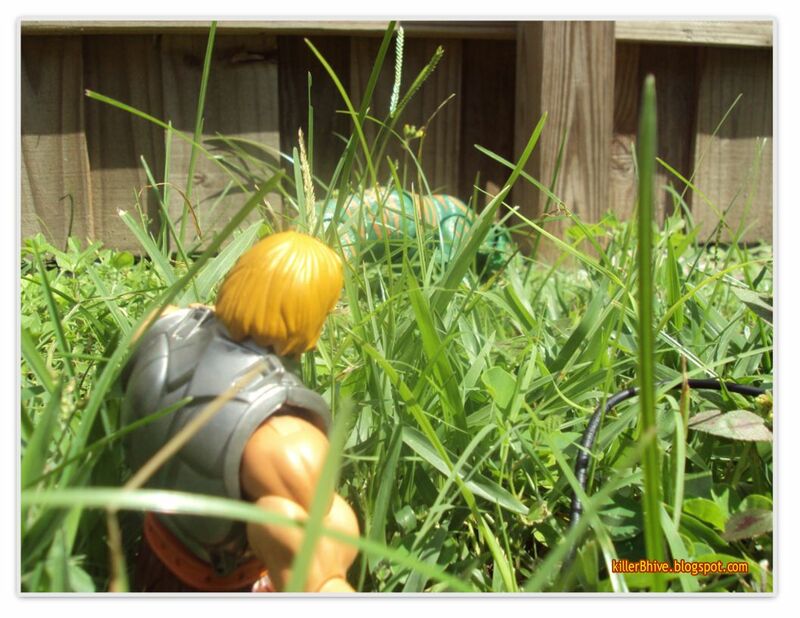 He is strong, fast and above all, loyal to preserving the freedom of Eternia. 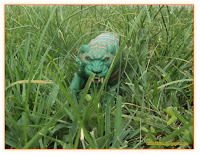 Battle Cat was originally released in February of 2010 and sold out quickly, being touted by many toy review sites and blogs as "Toy of the Year". He was later re-released in the Fall of that year and most recently released again during this past July's All-Star sale, which is when I was finally able to pick him up. Since then he's been on display at KBH-HQ in one way or another. There's no shortage of Battle Cat reviews around the net, so I wanted to take a different approach and offer some different looks at him with this edition of "Stinger Shots". 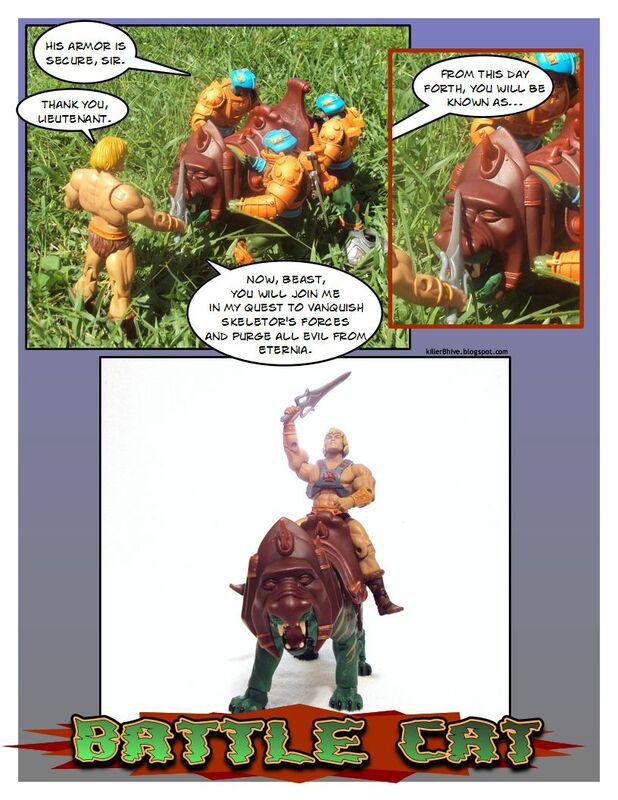 I thought it would be fun to make a little comic about how he and He-Man first encounter each other (in my own MotU-niverse) and not worry as much about sculpt/paint/articulation, which is well-documented as being fantastic. I hope you enjoyed the pictures and comics. It's funny how it only takes a few minutes to read through, yet takes hours to assemble. If you haven't bought BC, yet, you have another chance coming up on October 17th, when he'll be reissued on MattyCollector.com. Strangely enough, there aren't any prices listed yet, but he's previously sold for $30 (plus s&h), so you're looking at about $45 if you order him alone. Diehard He-Man fans enjoy him and casual collectors like myself enjoy him, too, so if you're thinking of getting him I'd say don't miss this oppurtunity considering Matty will stop reissuing older figures next year. "Ride the tiger, you can see his stripes, but you know he's clean!" Killer B Contest: Christmas Comes Early!